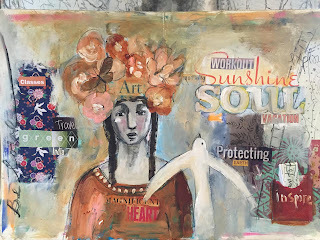 Lately, I have settled in to more of a routine, a rhythm that is the heART work I need. Transitions have occurred that have been big lessons of the heart, lessons I needed to learn to move forward. 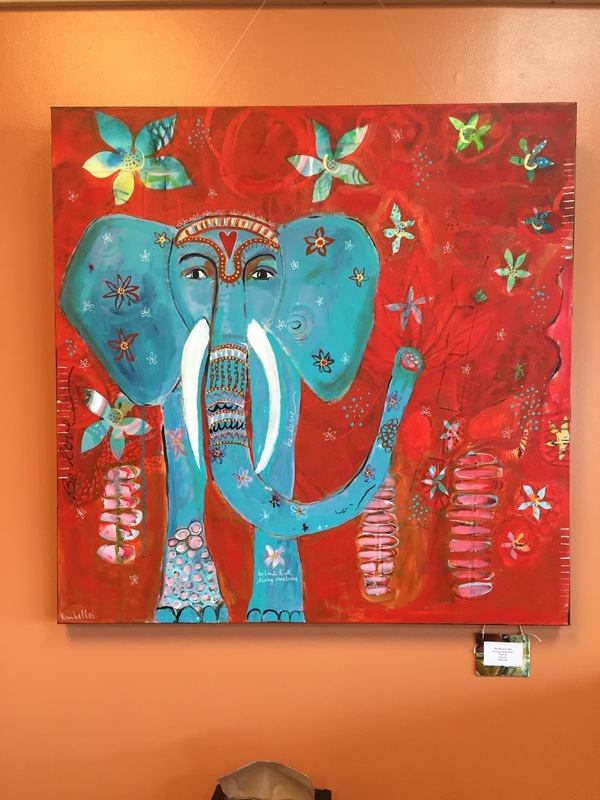 Yoga and art are a huge part of this transformation. 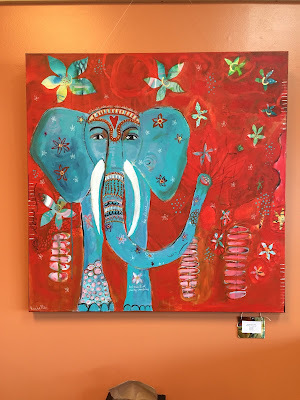 Practicing at Wilmington Yoga Center is inspiring and motivating. In January, I was in class and the instructor, Kristin Cooper Gulak was talking about the Kunga work they do with "Homes of Hope India". They literally build orphanages! At that moment, I decided that this year, my giving would go there. I am donating 10% of all earnings from my art sold and classes I teach in 2016 to Homes of Hope India. My heart is wide open. Knowing that I can make even the smallest difference in the lives of these children makes me happy. 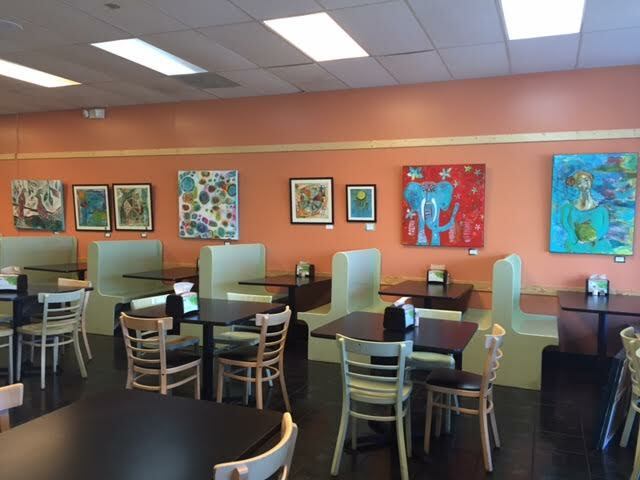 Currently, these works are on display at Lovey's Natural Foods Market and Cafe in Wilmington. During my work at the Karen Beasley Turtle Hospital, I learned even more about all of the dangers that our beloved, endangered sea turtles are faced with. From ghost gear, (floating discarded fishing line and gear), to plastics and balloons, boat propellers, and of course, their natural predators. It was an honor to help care for these beautiful creatures and help get them to the point where they could be released back into their natural habitat. 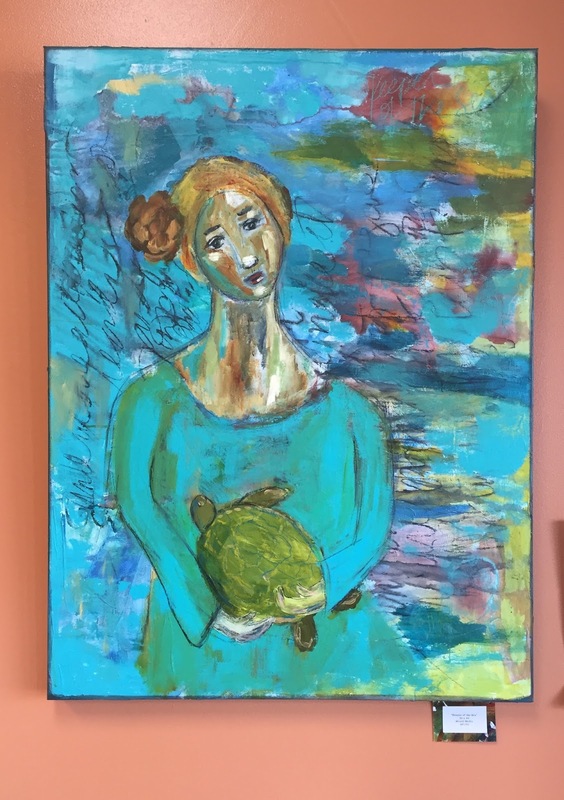 This painting has layers and layers of writing and paint as I intuitively painted a self portrait and a portrait of all of the beautiful "keepers of the sea". "Be Kind to ALL Living Creatures"
This intuitive painting was inspired by Rachael Hart and her great love for these beautiful creatures. 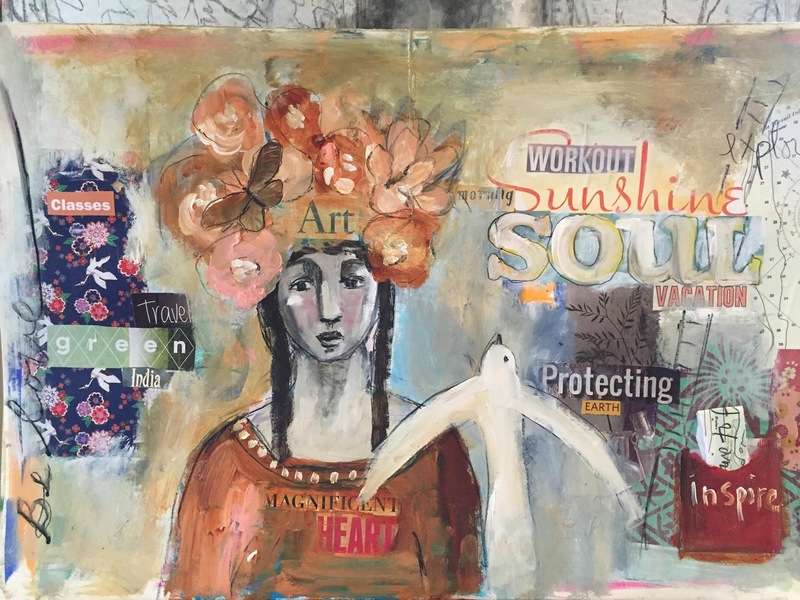 She has had first hand experience with these gentle loves and the photos she shared inspired me to create this painting and spread the word to be kind to all living creatures. The treatment of elephants and of other animals is tragic. This is a message to be love. Everywhere, to everyone, every day. Rachael Hart is an inspiration. "Be Love" mandala, and "Dreaming of Clean oceans where all beings are safe, loved and free"
This is a print that I had made form an original painting that was donated to "Hope from Helen" in December for their annual fundraiser and auction. Prints available in all sizes. Flowing and ever changing, colorful pods that we all are. I believe in embracing the human spirit and all of the differences and unique qualities we have. We are all human and we can learn love from each other. Spread love, and listen to the messenger of peace. "Be Love" and "We are all Connected"
"Be Love" is sold. "We are all Connected" is my version of a mandala. We are all connected and all human. This is a mandala of peace and love. Growing and emerging and meditating. Honoring ourselves just where we are we will find peace. I was recently in a yoga class with Noelle and one of the yogis said her mantra during meditation is "patient, calm, acceptance". I immediately held on to that and continue to use that as my mantra as well. It can mean different things to all of us, but the message is clear. Acceptance is key, no matter what we are going through or those we love are going through! 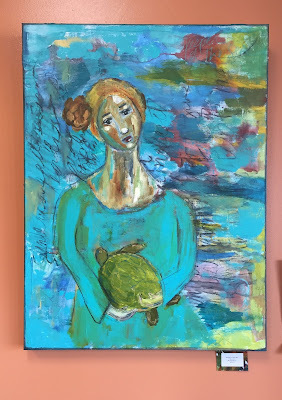 This is another painting inspired by the lovely humans who work at the turtle hospital and especially in honor of Jean Beasley, whose work and dedication to the turtles and their well being is exceptional and inspiring. This painting was done after a release at Topsail. Just knowing the turtles were going back to their natural habitat and that I had helped just a tiny bit along with many others was great feeling. If you ever have a chance to witness a release, do it! You will be filled with emotion and gratitude. Prayers for all of these turtles and for all sea creatures to be safe. This painting was painted on my anniversary last February. (20 years). Intuitively this came onto the canvas and serves as a reminder of my beautiful life and relationship with my best friend. 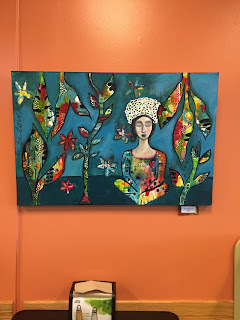 The Wilmington Art Association is have a show April 8th weekend (my birthday!! ), at the Hannah Block Community Arts Center. These two pieces will be on display during the show. I have been teaching more in my home studio, "heART Space". Private classes available in addition to group classes. When we trust our internal voice and let go of expectations, we open ourselves up to a world of creativity, and certainty exploding with endless possibilities and knowledge. 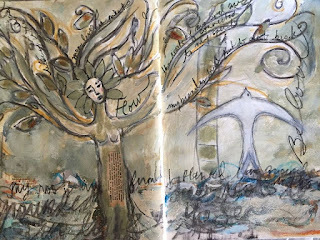 The practice of visual journaling enables us to acquire insight and understanding of the creative process through raw, honest, vulnerable truth, which is in essence, captured on our pages. 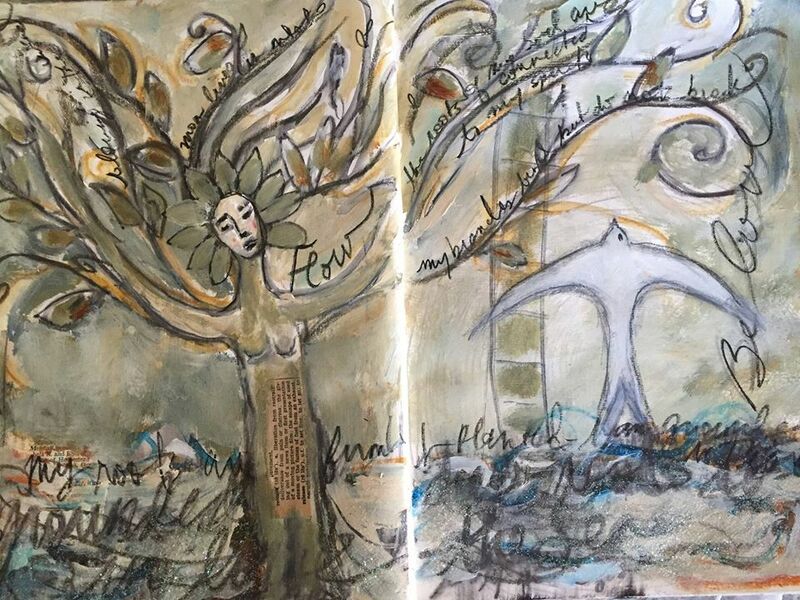 A constant element of change occurs as we move through the ebb and flow of our lives, and our visual journal offers us a safe and sacred space to explore, unfurl and bring forth change in our world. My are journaling practice has been a vital part of my daily routine for many years; one I depend on to save me, from my own self at times, and to savor the freedom to explore in an uninhibited way through expression with words, color, paint, collage, ephemera, mixed media, papers, and mark making tools. The sky is the limit where no rules apply. Remnants of memories and emotions spill onto the pages, assisting in letting go, being in the present moment, and moving forward. 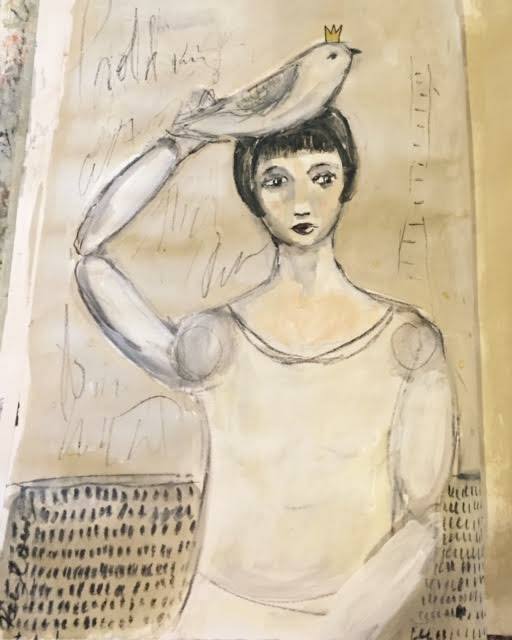 "Bookfest" - coming this summer, (July 30-31) to the Museum School. I will teach a workshop this summer making simple books. All of these books are made without coptic binding. Participants will take home a variety of little books to work in and learn some mixed media / visual journaling techniques during the workshop. 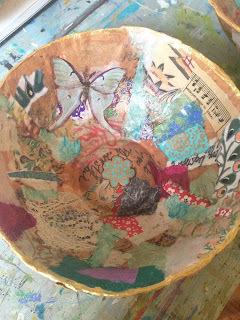 I am excited to teach a collaborative workshop with Kirah Van Sickle at the Museum School in April! 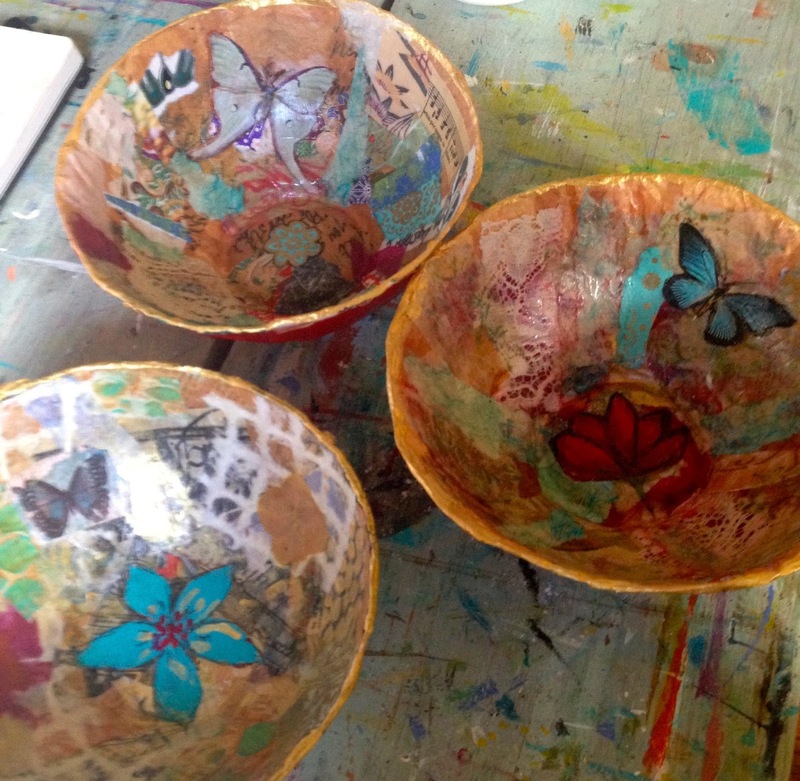 We will have a weekend filled with creative fun, making lots of gelli prints with the master, and making a "giving bowl" to cover with the gelli prints. These bowls make the best gift as they are covered in layers of beautiful papers and you can write love letters/ intentions/ mantras, to the recipient. They are for giving or for keeping, and are lovely and meaningful. Interested in this class? Sign up HERE! Leslie Marsh is coming to my studio September 3-4. She is well known for her beautiful and unique hand made books. We will create a beautiful book with eco-dyed pages! Please join us if you can. Sign up HERE! I am super excited for my friend Angelic and the soon to be grand opening of her beautiful new space, "Her Bohemian Way" in Snead's Ferry NC. 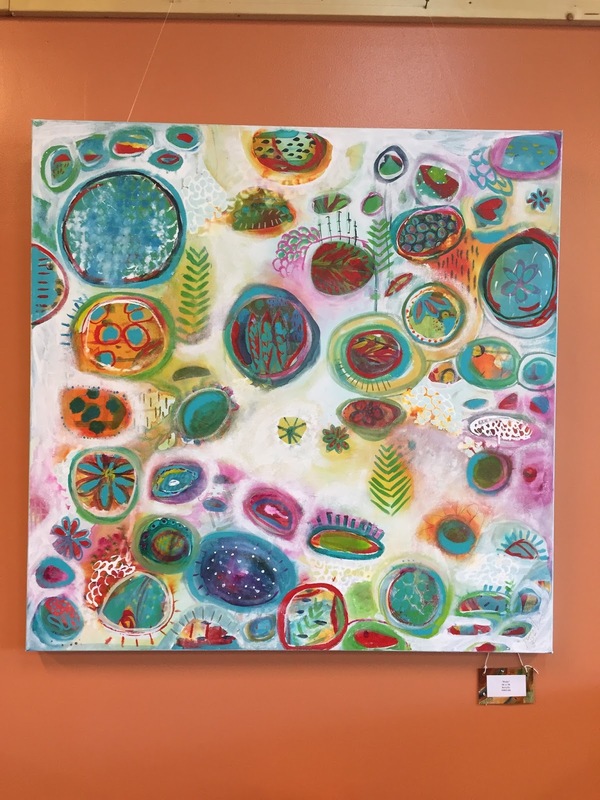 Please check out her website and all of the amazing things she will have going on in her space. In a beautiful setting on the water in Snead's Ferry, she will have classes and workshops, yoga, crystals, jewelry, art, music and much more. I will be teaching a Chakra Wall Hanging Workshop there Saturday, June 11. 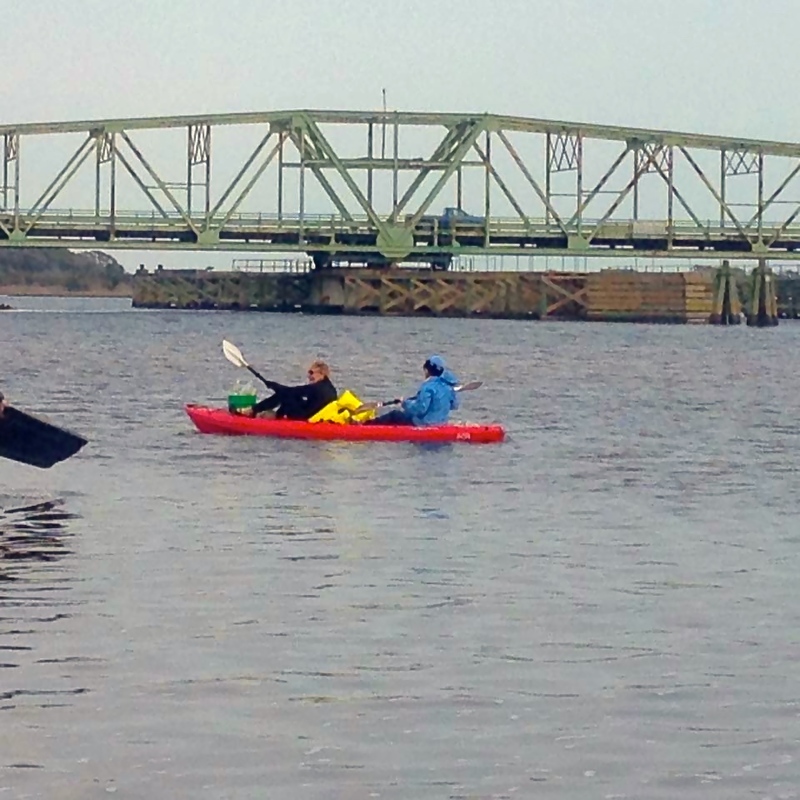 Keeping it clean, one kayak trip at a time. COMMUNITY CLEANUP in MIDDLE SOUND. 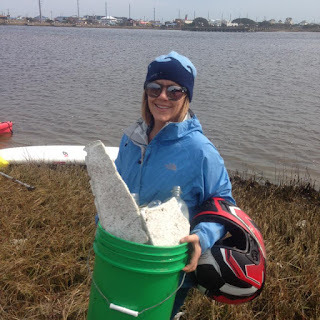 Recently I have noticed much more litter on the 5 mile loop I call home. Middle Sound Loop is surrounded by marsh, wetlands, creeks and the intracoastal waterway. After reaching out to area neighbors and residents, I organized a community cleanup. Students from UNCW POP did a presentation about how litter affects our oceans and marine life at Ogden Elementary School prior to the cleanup, and we encouraged students and their families to join us. The cleanup was a huge success as the community came together and collectively removed over 700 pounds of trash and debris from the loop. A huge thank you to all who participated. Plastic Ocean Project teamed up with Wrightsville Beach Keep it Clean and Surfrider, Cape Fear Chapter to start a campaign in hopes of reducing the use of straws in area restaurants. I designed a certificate that all participants can proudly display in their restaurant or business. We have had a tremendous response and have certified many restaurants and even an acupuncture business as "Ocean Friendly" Follow us on Facebook, and check our website for a list of Ocean Friendly Establishments. Please support these restaurants when you are in Wilmington and Wrightsville Beach. 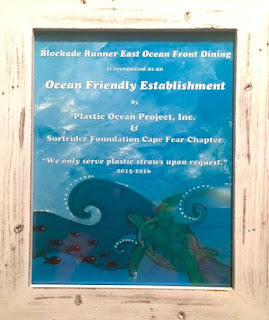 Blockade Runner East Ocean Front Dining was the first to sign up! Trip ha you had some great time looks everyone had a lot of fun and had full of the trip i wish i could come with you guys but i have a lot of work. Good luck for more. You look really talented by the way you’ve created such drawing although this isn’t your full time work not everyone has the same potential. Great work!